We are the Scottish Sales & Service Agents for MHG Heating Ltd and are specialists on the full range of MHG Procon Boilers and Pressure Manager Pressurisation Units. We have 26 Years’ experience on MHS Boilers range of equipment including Strata 1, 2 & 3, Strata Streamline, Ultramax WM and Floor Standing boilers, Duplex, Jupiter Boilers, Pisces Press Units. We’re available for direct commissioning & service work on most of MHS equipment without going via the manufacturer. We’re agents for Mikrofill Boilers & Pressurisation Units & also agents for AO Smith Water Heaters. 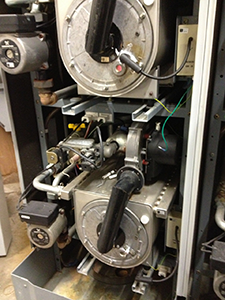 We can commission, service & maintain most manufacturer’s equipment. Call us for more details. We carry a range of spares for the Procon boilers and endeavour to try and carry out any repairs during the first visit to site. For all of the above mentioned equipment if we do not have parts in our van stock we can normally obtain the parts within one working day. We have over Twenty Five Years experience on the MHS Boilers range if equipment, including Strata 1, 2 & 3 boilers (We can now offer to supply and install the MHG Procon 77 which is a DIRECT Replacement boiler for the Strata 1 45 – 75 which fits the existing pipework, electrics and flue).